I had some "visitors" who came over to my house last Sunday. They were none other than my sis, Rose and her buddy, Aliza. Waa .. wat should I serve them. 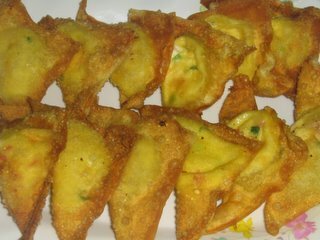 I looked in the fridge and kitchen cabinet and in the end, I baked Pizza made of instant prata as the base, made Konnyaku Jelly using Longan and Red Date packet drinks and also tried making Crab Rangoon. I read on the net that Crab Rangoon is served as appetisers in Chinese Restaurants. Cream cheese lovers would definitely luuurve this. Here .. take a peek.